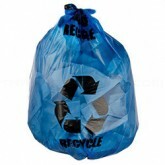 Blue trash bags are increasingly popular for use where a recycling program is in place and are designed for recycling paper, cans, plastic bottles and more. 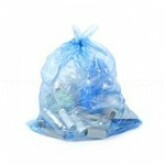 The translucent blue bag allows for quick and easy visual confirmation of the contents and prevents unwanted disposal of recyclable materials. Produced with only the highest quality LLDPE virgin resins enables these recycle bags to stretch, resist tears and puncturing. The star seal bottom eliminates gaps along the seal where leaks can occur and allows the bag to conform to the shape of the container while distributing the weight of the refuse evenly around the bag. Flat packed in white box.